LeapFrog today unveiled a couple of new additions to their lineup of children’s tablets, the LeapPad 3 and LeapPad Ultra XDi. Both of the new tablets will give children access to hundreds of educational apps, books, games and videos in a highly durable design. Kids will also have an incredibly safe web browsing experience straight out of the box. The LeapPad 3 and LeapPad Ultra XDi will come with LeapFrog’s Learning Library that has been approved by a team of LeapFrog’s own learning experts. The tablets feature shatter-safe screens and the most kid-appropriate web experience, albeit a limited one. The LeapPad 3 has 4GB of memory and two 2.0 mega-pixel front and rear-facing cameras for pictures and videos. The LeapPad 3 also has a built-in lithium ion rechargeable battery. The LeapPad Ultra XDi is a seven-inch Wi-Fi enabled tablet that offers a high-resolution touch screen and 8GB of memory, on top of the access to hundreds of downloadable apps. The Ultra XDi will also have front and rear-facing cameras and a rechargeable battery. The LeapPad 3 will have an MSRP of $99.99 and will be available in pink and green on July 16 for pre-order before hitting the shelves in August. 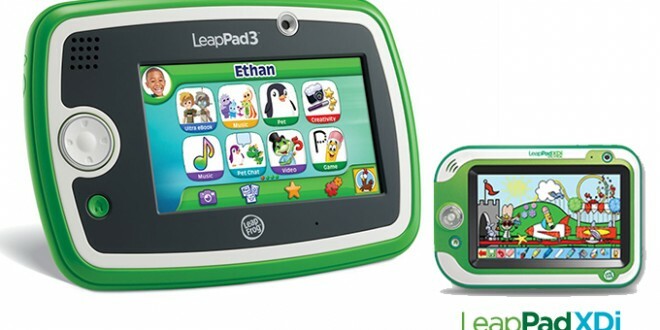 The LeapPad Ultra XDi will retail for $129.99–also in pink or green–and will hit major retailers in Fall 2014. But while these childrens’ geared tablets surely look the part, you’ll likely be disappointed with the limited number of apps available versus if you were to buy a cheap Android tablet for your child. As a parent, trust me when I tell you that you’re much better off going the Android tablet route and just using child-safety settings for it. And if it is the “child look” you’re looking for, there are an endless number of cases available for many Android tablets that would also fit into that mold. The problem with LeapFrog’s tablet lineup is that they are too limited. Even though they’re designed with buttons for children, kids nowadays don’t have any issues navigating smart devices. Maybe five years ago these would have been exciting to parents, but there are better tablets available now that are comparable in price.